This spreadsheet performs stress analysis of a precast prestressed bridge girder at the prestress transfer and service stages. It sizes the girder and determines the amount of prestressing steel. 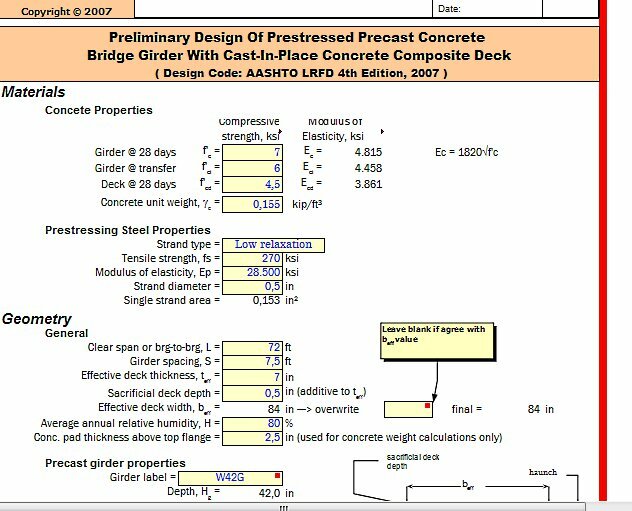 The formulas and procedures used in the spreadsheet are accurate and comply with the 4th Edition of AASHTO LRFD; however, a full code check is required for bridge girder design beyond the scope of PSGSimple. simple span dead and live load moment calculations (may be overwritten by the user. moving load distribution factor calculations. permanent and temporary prestressing strands layout. immediate and long-term prestressing losses calculations. 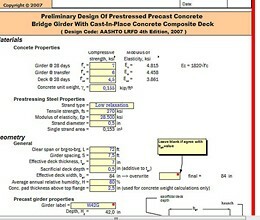 concrete stress calculations for two sections (midspan for service loads and strands harp point for prestress transfer stage). * PSGSimple download link provides demo version of the software. PSGSimple has been rated 3.0 out of 5 points. A total of 2 votes cast and 0 users reviewed the software.